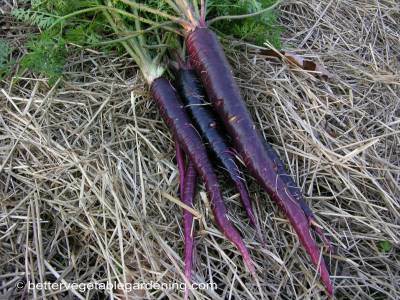 The carrot is a hardy, cool-season biennial which is cultivated domestically for the root. When carrots are left in the ground until their second year, they will flower and go to seed. The flowering stems, depending on variety, can grow up to 3 ft (1 meter) tall, with an umbel of white flowers. Carrot sizes range from baby carrot varieties, not just big carrots harvested early, that are fully mature at 4 inches (10 cm) long, the heavy weights growing to 9-10 inches (22-25 cm) long and with many varieties somewhere in-between. Where orange used to be the norm for home grown carrots and anything else was considered a novelty, seed is readily available for a range of colors. From purple, white, red, and all shades of yellow to deep orange. 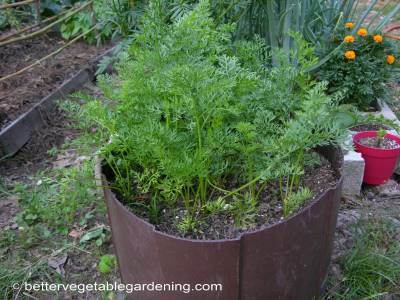 It really is amazing how many carrots can be grown in a container or half drum like this one. Carrots are relatively tolerant of a wide variety of temperatures. Although they can endure summer heat in many areas, they prefer cooler growing conditions and grow best when planted as soon as the soil can be prepared in the early spring. Soil with a pH of 6.5 to 7.0. is good. Growing Carrots on heavy, stony, clod or trash-laden soils will produce defective shaped roots that are mostly forked or twisted. To allow for good root development, carrots should be sown in a deep, loose, well-drained soil that has been well worked to a depth of 12" or more. 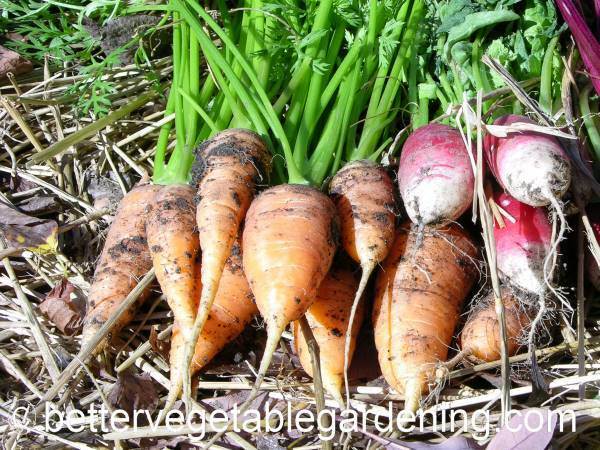 Raised bed gardens are usually excellent for growing carrots as they, more often than not, have loose soil because they receive little or no compaction from foot traffic. Like all root crops, carrots require good amounts of potassium for good production. For details on fertilizer suitable for carrots click this link. The soil should be prepared to a depth of 12 inches, (30 cm) in well worked to break up clumps and clods that prevent easy penetration of the roots and finally smooth the bed to a fine surface before planting. 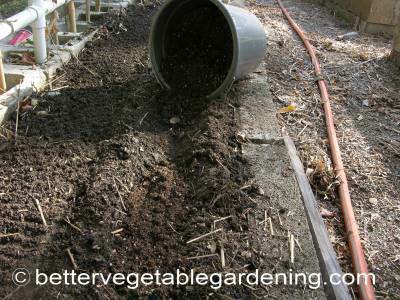 Using potting mix in the seed bed is a good way to provide a weed free bed for growing carrots in the home vegetable garden. 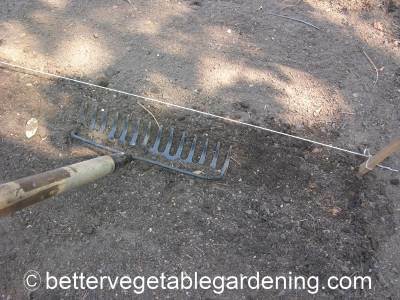 Plant seeds at a depth of 1/4 inch (6-7 mm) and1inch (25 mm) apart in the row. Space the rows 12-18 inches (30-45 cm) apart. 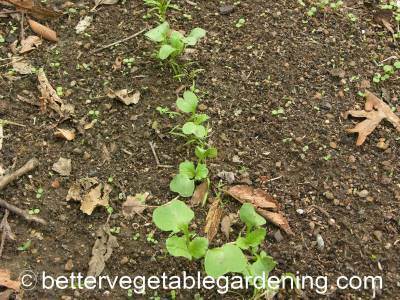 Radish seeds will germinate in a few days and are often sown with carrot seeds to help visual establishment of the row. Sprinkle the soil with water after planting and cover with newspaper or light mulch to protect from sun and rain. 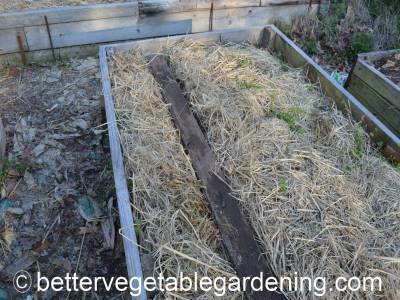 Covering the seedbed with a board is another way of protecting seeds from being washed away in areas that experience heavy rainfall in early spring..
Just remember to lift the board up daily to check for young seedlings emerging and remove the board when they do. Carrots don’t require much space between them in the rows; the actual spacing will depend to some extent on the variety and end use. Thin carrots at about 3 weeks. If you're planning on harvesting your crop as baby carrots, thinning them to a tighter spacing of 1-2 inches (25-50 mm) will work fine. 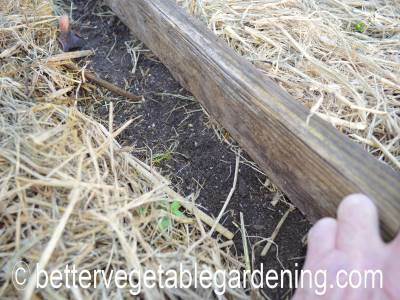 Keep an eye on the carrot beds and any time carrots are big enough thin the bed. Any excuse to eat young tender carrots is good enough. 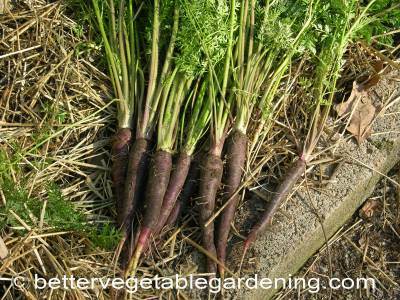 However if you intend to let the carrots grow to maturity, thinning to a final spacing of 2-4 inches (5-10 cm) is good. 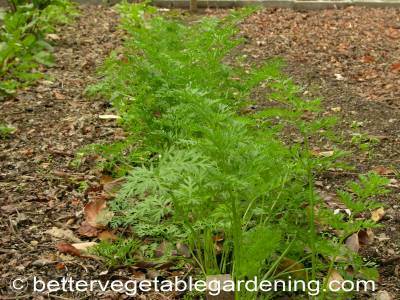 Young carrot seedlings are weak and grow slowly. Deep cultivation may injure the roots, so it is essential to keep weeds under control for the beginning. After plants are established, applied mulches will help conserve moisture and suppress weed growth. Keep the mulch right over the crowns of the carrots because if exposed to the sun they will become sun burned and turn green. 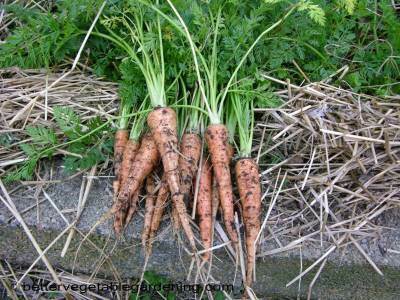 Carrots need relatively large amounts of water to become well established and to produce good roots. Even moisture content is essential for carrots, they are not very tolerant of a dried out soil. Carrots need at least 1 inch (25 mm) of water per week. This is best applied as one, thorough soaking of the soil rather than more often shallow wetting. However, avoid too much moisture towards the end of the season as this can cause roots to crack and quickly rot. Fertilize the carrot bed 2 weeks before sowing with 2-3 quarts per 100 sq feet (2.2-3.3 liters per 9.3 square meters) of All-Purpose 5-5-5 Organic Fertilizer should see most crops to a successful harvest. A side dressing of the same rate and fertilizer can be applied after 30 to 40 days if required to maintain good ongoing growth. 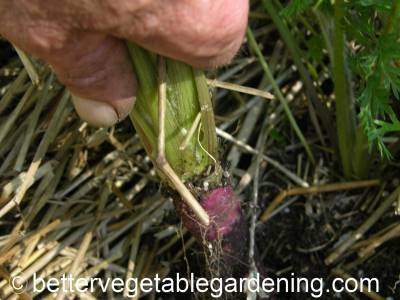 Follow root crops like carrots, parsnips and beets with leaf vegetables. Most of the cabbage family and lettuce are fine for this. Leafhoppers, Wireworms, and Carrot Rust Fly Larvae. Aster Yellow, Leaf spot and Soft Rot. Carrots are an easy to harvest crop. For baby carrots, harvest the roots when they reach finger size and 4-5 inches (10-12 cm) in length. Mature carrots are usually harvested when the roots are 3/4-1-1/2 inches (18-38 mm) in diameter at the upper end, but can be harvested any time they reach a usable size. Carrot tops may not be strong enough to withstand actually being pulled from the ground and digging helps to remove the roots without damage. Carrots for storage need to be handled carefully during and after harvest to avoid bruising, cutting and breakage. 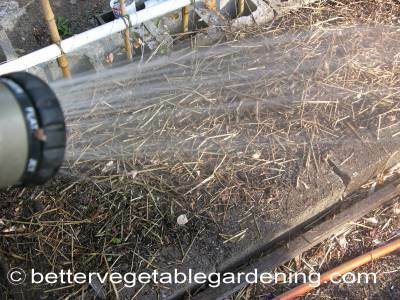 Carrots can be left in the ground and covered with heavy mulch until early to mid winter as long as they do not freeze. It is best to store carrots with the green tops trimmed. Although the tops are edible, during storage this greenery robs the carrot of moisture and nutritional value. Mature carrots are excellent for storing and will keep for 7 to 9 months at 32 F (0 C) with a high relative humidity, 98-100%. Carrots can also be canned or frozen.